The Alexander Signature Series is, as the name suggests, the signature line from Nest Bedding. This memory foam mattress looks to provide a luxury mattress feel at a lower cost than the alternative. Interested in finding out if the Alexander Signature Series achieves its goal? Read on for my full review! Due to their belief that no single mattress could be the perfect fit for everyone, Nest bedding carries a line of mattresses that vary in design and feel to help find the perfect fit for you. All of their mattresses are made in the United States and can be shipped directly to your door or purchased in one of their stores across the country. In this review I take a look at their Alexander Signature Series model, and put it through some tests to see how it performs. To get a better idea of the Alexander Signature Series, let’s first take a look at how the mattress is constructed. As I mentioned before, this mattress uses memory foam to achieve a luxury feel and because of this I expect it to provide great pressure relief. One thing to note about memory foam is that it has a reputation for trapping body heat at times, so I’ll be looking to see how Nest built this mattress to defend against sleeping too hot. Cover – The cover of the Alexander Signature Series is a polyester/cotton blend and the top part is pretty thin, making it breathable to help with temperature regulation. There is also a 2 inch layer of foam quilted into the cover which makes the initial feel of the mattress very soft, which helps to relieve pressure. At this point I would like to mention that this mattress comes in three different firmness levels: Soft, Medium, and Luxury Firm. Each level varies slightly in construction and materials used, and for this review I had a look at the Medium firmness option. Comfort Layer – The comfort layer of the Alexander Signature is made of 4 inches of gel memory foam. Gel memory foam is used to help with pressure regulation because while regular memory foam can trap too much body heat, the gel infusion helps to pull heat away from the person in bed to help sleep cooler. 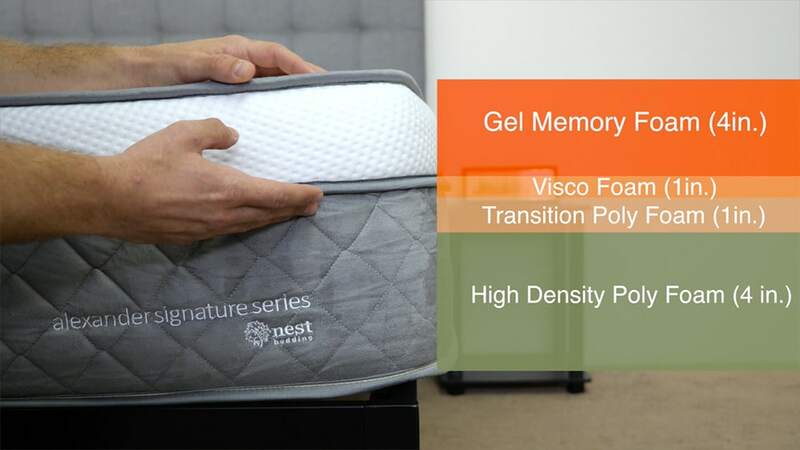 By placing a thick layer of memory foam so close to the sleeping surface, Nest ensures the sleeper will experience the pressure relieving benefits of the soft material. This layer is slow to respond to pressure and provides the mattress with body contouring, which will add to the classic memory foam feeling of sinking into the mattress. Visco Foam – This layer is another inch of memory foam, which will act to further relieve pressure. This layer will allow you to sink into the mattress a bit more, while also beginning to change the feel of the mattress from the memory foam on top. Transition Layer – This one inch layer of polyurethane foam is meant to provide some initial support to the sleeper as the sink into the mattress. It acts as the transition layer from the soft memory foam above to the firm base layer, so the sleeper doesn’t hit a sudden change in feeling as they sink into the mattress a bit. Base – This 4 inch layer of high density poly foam acts as the foundation of the mattress, supporting the layers of foam above it and the sleeper on top of the bed. The layer gives the mattress its shape and helps lend some durability to the structure. Different Firmness Levels – As I mentioned before the Alexander Signature also comes in Soft and Luxury Firm versions. These options have slightly different constructions and use different types of materials to create those feels. The Soft version of the mattress has a 1.5 inch quilted cover which sits directly over a comfort layer of 2 inches of gel memory foam. Beneath that there is 2 inches of visco foam followed by a 3 inch transition layer of poly foam. The base of the Alexander Signature Soft consists of 4 inches of high density poly foam. The Alexander Signature Luxury Firm is made up of 3 total layers of foam. The base of the Luxury Firm mattress is 6 inches of high density poly foam, just like the other two versions. The comfort layer of the Luxury Firm version is 2 inches of gel memory foam, which sits directly over a 3 inch poly foam transition layer. The cover of this mattress version is also quilted with 1.5 inches of foam. Love the memory foam feel? 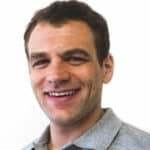 Check out my best memory foam page for top picks! 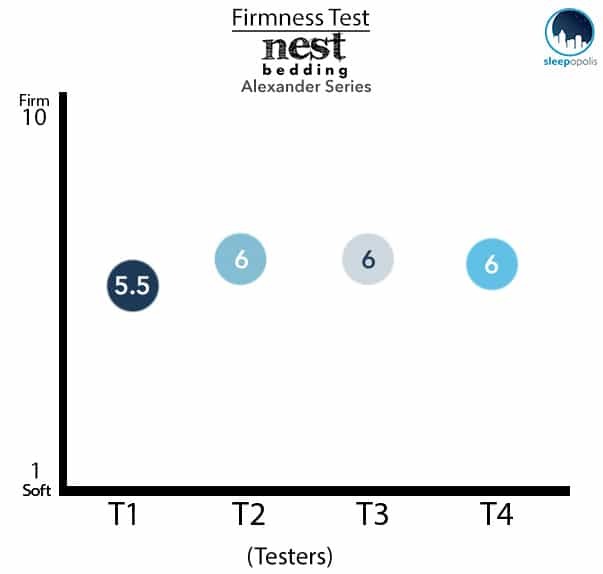 Now that we’ve taken a look at what makes up the Alexander Signature Series, it’s time to discuss the feel and firmness of the mattress. When I first press into the mattress, the initial feel is of the soft quilted cover on top. Once I pushed through the quilted foam, I began to feel the gel memory foam beneath and it began to contour to my hand. By combining the quilted cover with the thick memory foam layer, Nest created a mattress that provides good pressure relief to the sleeper. People will feel the firmness of a mattress differently depending on their size and body type. Rather than just giving my opinion on the overall firmness level, I brought in three other people to give their opinion as well. This should give you a better idea for the firmness range you can expect from the Alexander Signature. This is the Medium version of this mattress and as you can see from the chart above our testers felt it lived up to its name. With a range of 5.5-6.0 out of 10 on the firmness scale, the Alexander Signature falls squarely into the medium firmness range. A medium firmness is meant to appeal to a wide variety of sleeping preferences. Side sleepers tend to prefer softer mattresses that allow their shoulders and hips to sink in a bit, while back and stomach sleepers will often want a firmer mattress that will be able to keep their spine aligned properly. 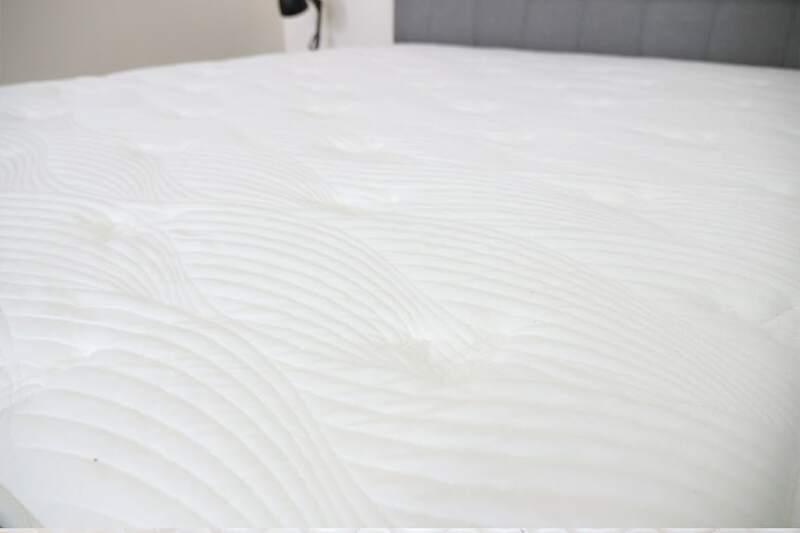 By offering a medium firmness, the Alexander Signature provides a good feeling of mixed pressure relief and support for those whose sleeping needs aren’t to specific or maybe change position during the night. Based on the materials used and layering of the soft mattress I would assume that it would be more in the 4-5 out of 10 range. This would be a really soft feel, causing the sleeper to sink into the mattress more, offering great pressure relief, which would be great for side sleepers. Also, given the layers of the Firm version, I would anticipate a feeling in the 8 out of 10 range on the firmness scale. This would provide great support for back and stomach sleepers. FAQ: Should you go for a firm or soft mattress? Instead of just describing the firmness and feel of the mattress, I wanted to give a visual representation of where someone may feel pressure points form while lying on the Alexander Signature mattress. To do this, I placed a pressure map on top of the mattress and lied on my back, side, and stomach. On the image below, pressure will be represented from blue (low pressure) to red (high pressure). 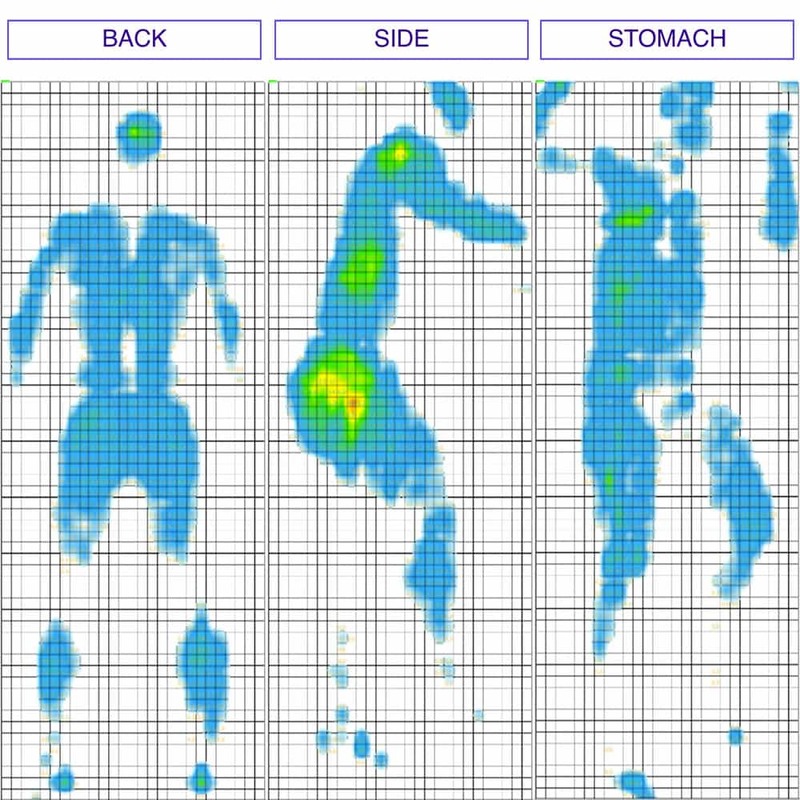 Pressure map for the Alexander Signature mattress showing me laying on my back, side, and stomach. When I first lied down on my back the quilted cover creates an initial soft feeling to the mattress. You can see from the results above that the Alexander Signature did a good job of evenly distributing my weight in this position, which led to low pressure across my entire body. As I lied there a bit longer I could feel myself sinking into the thick memory foam layer of the mattress and I definitely felt like I was more in the mattress than on top of it. The slow responding memory foam on top contoured well to my body, leading to a feeling that changing positions took a bit of effort. Once I moved onto my side, the results show some increased pressure at the hips and shoulder, which is to be expected due to a higher weight concentration. The thick memory foam layer on top of this mattress is a great benefit to side sleepers as the material is known for its pressure relief. 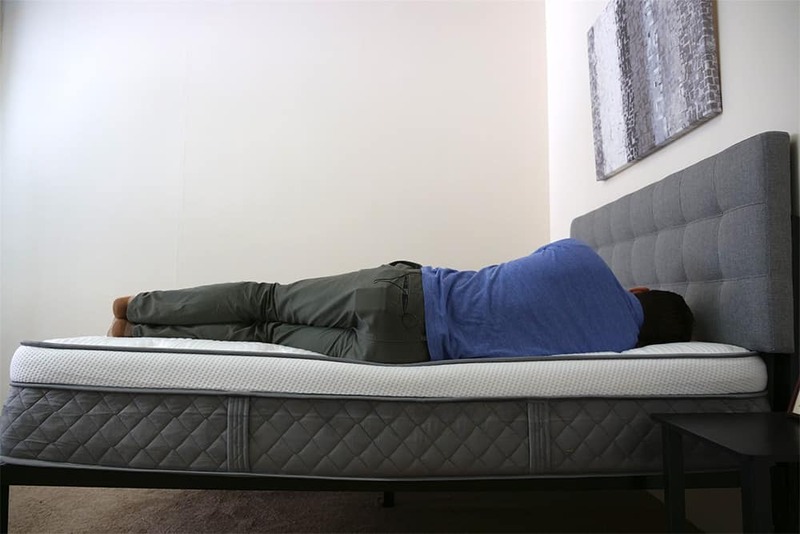 I felt like the Medium version of the mattress provided good pressure relief, but if you are a strict side sleeper or a bit heavier you may want to consider the soft version of the mattress. Finally, on my stomach, results again show low pressure across my entire body thanks in part to even weight distribution. It’s important for stomach sleepers to have low pressure on their chests so they can breath easily and I never felt this was an issue in this position. It is also very important for stomach sleepers to have a mattress that keeps their hips up so their back stays in a good position. Because of this many stomach sleepers prefer firmer mattresses, and while I felt the Medium did a good job of keeping my hips from sinking too much, those with more specific preferences may want to have a look at the Luxury Firm version of the Alexander Signature. If you are going to share your bed with a partner, you will want to know what it will feel like when the other person gets into and out of bed or toss and turn at night. 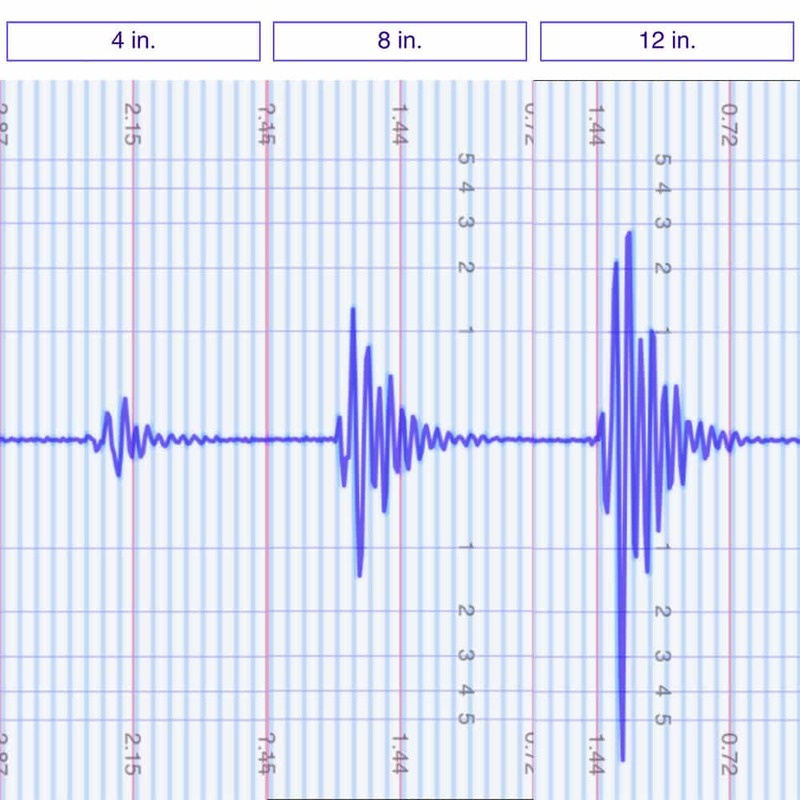 The next test is helpful in showing the intensity of disturbance detectable from one side of the mattress when there is motion on the other. Thanks to the thick memory foam layer on top of the Alexander Signature I was expecting it to perform well on this test and it did not disappoint. The 4 inch drop simulates someone changing positions on the other side of the bed and you can see in the results above that there was very little motion detectable from the other side of the bed. 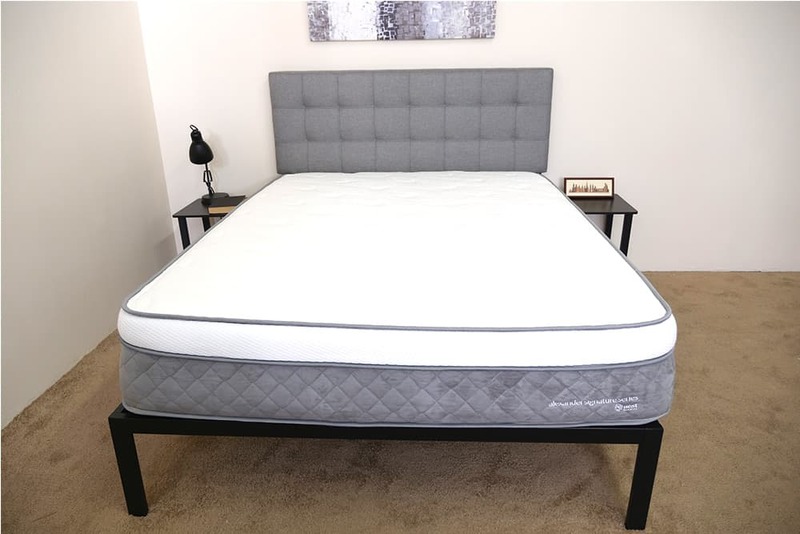 The 8 inch drop is meant to simulate someone getting into bed and the Alexander Signature performs very well on this drop when compared to other foam mattresses. Finally, the 12 inch drop is used to show how much disturbance would be felt if someone jumped into bed and we see a large spike on that result, but the disturbance quickly dies down. FAQ: Which mattresses are best for people that sleep with a partner? 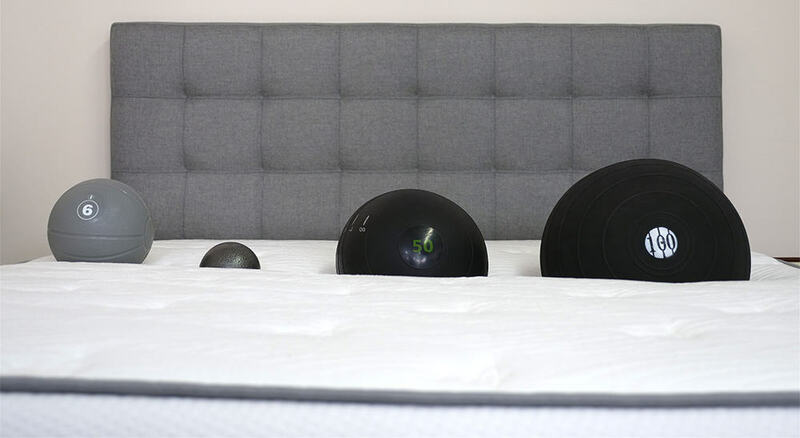 In order to get a good idea of how someone might sink into a mattress, I use four balls of varying sizes and densities (a 6 lb medicine ball, an 8 lb medicine ball, a 10 lb steel ball, and a 50 lb medicine ball) and place them on the Alexander Signature to measure how much they compress the surface. 50 lb medicine ball: Just over 4 inches of sinkage. 100 pound medicine ball: 6 inches of sinkage. If you are going to share your bed with a partner and need to use the entire surface area of the mattress, then edge support is going to be important to have a look at. Foam mattresses can sometimes struggle to live up to the edge support of traditional innerspring mattresses, so I wanted to have a look at how I would feel near the side of the bed. When lying near the side of the Alexander Signature I felt even support from the side of the mattress to the edge and I was even able to change positions and roll around without worrying that I was going to fall out of bed. You can see from the image above that I was able to sleep on the edge of the mattress and have a good combination of support and pressure relief to keep my spine aligned. When I moved onto my side and hung off the mattress a bit I saw some compression of the memory foam layer, but still felt secure in my position on the mattress. By sitting up on the side of the bed, simulating getting my shoes on in the morning or getting into bed at night, I have all of my weight over one location on the mattress. Again, there is some compression through the memory foam layer of the Alexander Signature, but this is pretty common among foam mattresses. Sleep Trial: Nest Bedding offers a 100 night sleep trial on the Alexander Signature. Warranty: Nest offers a lifetime warranty on all of their mattresses. Shipping: Free to the continental United States and will arrive compressed in a box. Convinced the Alexander Signature series is the right mattress for you? Save $100 by using the code “SLEEPOPOLIS100”! Is the Alexander Signature Series right for you? Now that we’ve taken a deep dive into the Alexander Signature Series from Nest Bedding it’s time to go over who I think it would be a good fit for. Luxury Feel – This mattress delivers a classic memory foam feel of sinking in and has a very solid construction, which isn’t always something associated with foam mattresses. 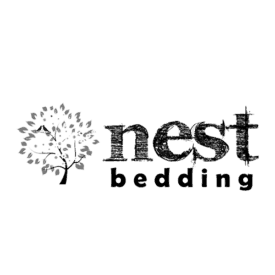 In my opinion, Nest Bedding accomplish the luxury feel they were aiming for. 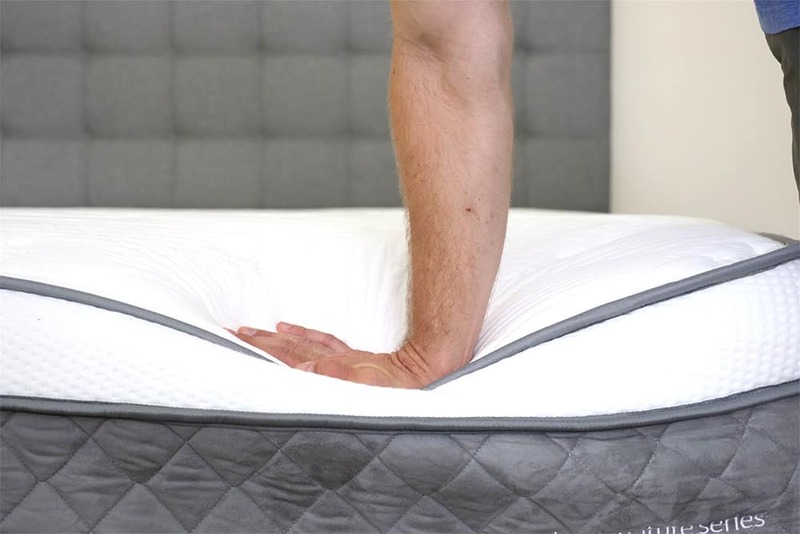 Pressure Relief – The combination of the quilted cover with the thick memory foam on top allow you to sink into the mattress and combine to provide great pressure relief. The pressure relieving benefits of the memory foam make the Alexander Signature a good choice for side sleepers. Memory Foam – While lying on the Alexander Signature I felt the mattress contour to my body well and really had the feeling of sinking into bed that is associated with memory foam. I tested out the Medium version, but both the Soft and Luxury Firm versions of this mattress have memory foam comfort layers as well, so I would expect this to be true of all three. For more information the Alexander mattress visit NestBedding.com. If you decide to go with the Alexander don’t forget to grab our $100 off promo code. Use code “SLEEPOPOLIS100” at check out. The Nest Alexander Signature is an all foam mattress that uses thick layers of memory foam to provide great pressure relief. This mattress has a noticeably robust construction and luxurious feel that provide pressure relief for a variety of sleeping styles and positions. The quilted and padded cover give the Alexander a classic feel on top, while the foam layers provide a modern supportive contouring foundation. The mattress has a plush feel that allows sleepers to sink deep into bed.